A team of MDM students won the student award at the Vancouver User Experience Awards last Thursday. 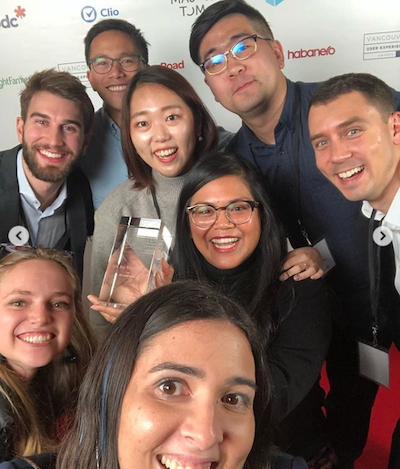 Team Accenture, which includes Alyzah Kaharin, Charity Principe, Rex Shi, Joseph Coombes, Mengxuan (Amy) Li and So Jeong Bae, won for an augmented reality training app they built for insurance estimators. The winning MDM team (Charity Principe, Rex Shi, Joseph Coombes, So Jeong Bae and Alyzah Kahariane) used the power of AR (augmented reality) to create an app that provides self-guided lessons for estimators. Using life-sized vehicle models in real space, estimators can practice their critical-thinking and decision-making skills. It is the first time MDM students have submitted a project to the UX competition. Richard Smith, director of the Centre for Digital Media, describes the project as an exceptional piece of work. "This team did what is most difficult in user experience design: creating an interface that disappears and just seems to be right, right from the beginning." All three finalist teams for the UX Student category were from SFU. Read more about the finalist teams.